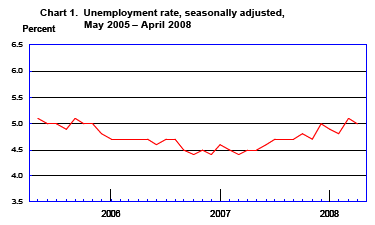 On May 2nd the Bureau of Labor Statistics (BLS) released the April Employment Report. Here is a synopsis of that report. Nonfarm payroll employment was little changed in April (-20,000), following job losses that totaled 240,000 in the first 3 months of the year, the Bureau of Labor Statistics of the U.S. Department of Labor reported today. The unemployment rate, at 5.0 percent, also was little changed in April. Employment continued to decline in construction, manufacturing, and retail trade, while jobs were added in health care and in professional and technical services. The following chart is thanks to VisionsFromSpace. Data for the chart came from the BLS. 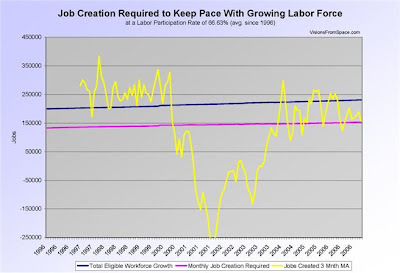 The above chart shows the economy needs to create 150,000 jobs a month just to keep up with population growth. Over the past 3 months the economy has lost 240,000 jobs. The establishment data was the 5 consecutive disaster. A whopping 110,000 goods producing jobs in total were lost (higher paying jobs), while mostly lower paying service sector jobs were added. This was a very weak jobs report. But it is even worse when one looks at Birth/Death Model assumptions. Once again the BLS should be embarrassed to report this data. Its model suggests that there was 45,000 jobs coming from new construction businesses, 72,000 jobs coming from professional services, and a whopping 267,000 jobs in total coming from net new business creation. The only line items in the above chart that are reasonable are manufacturing and resources and mining. The economy has slowed to a standstill and the BLS model still has the economy expanding at a rapid clip. Repeating what I said last month, virtually no one can possibly believe this data. The data is so bad, I doubt those at the BLS even believe it. But that is what their model says so that is what they report. Just as there is mark to model in the investment world, there is mark to model in the BLS world. For those unfamiliar with the birth/death model, monthly jobs adjustments are made by the BLS based on economic assumptions about the birth and death of businesses (not individuals). Those assumptions are made according to estimates of where the BLS thinks we are in the economic cycle. The BLS will not disclose what their methodology is or even on what it is based. Essentially it is a "black box" with the BLS essentially saying "trust us, we know what we are doing". The BLS has admitted however, that their model will be wrong at economic turning points. The latest birth/death numbers appear to be from an alternate universe, most like Bizarro World where up means down. With housing falling like a rock and commercial real estate now following suit, the BLS is assuming that 45,000 new jobs were added in construction. With lenders blowing up and countless self employed real estate professional exiting the business the BLS is assuming 8,000 new jobs were added in financial activities and 72,000 jobs from professional and business services. The total number of jobs added in April by such absurd assumptions was 267,000 jobs. No doubt you will see some who will subtract 267,000 jobs from -20,000 jobs and conclude that 287,000 jobs were lost as opposed to the reported loss of 20,000 jobs. Such math is inaccurate because the establishment numbers are seasonally adjusted and the birth/death assumptions are not and one cannot simply add the two together and come up with an accurate total. Here is the pertinent snip from the BLS on Birth/Death Methodology. The net birth/death model component figures are unique to each month and exhibit a seasonal pattern that can result in negative adjustments in some months. These models do not attempt to correct for any other potential error sources in the CES estimates such as sampling error or design limitations. Note that the net birth/death figures are not seasonally adjusted, and are applied to not seasonally adjusted monthly employment links to determine the final estimate. The most significant potential drawback to this or any model-based approach is that time series modeling assumes a predictable continuation of historical patterns and relationships and therefore is likely to have some difficulty producing reliable estimates at economic turning points or during periods when there are sudden changes in trend. The important point in this mess is that both the job data and employment data are much worse than appears at first glance (and the first glance looked horrid). If you start counting all the people that want a job but gave up, all the people with part-time jobs that want a full-time job, etc., you get a closer picture of what the unemployment rate is. The official government number fell to 5.0% in April, but Table A-12 suggests it rose to 9.2%. I believe the latter number is on the low side. I am still expecting to see unemployment head towards 6% this year, but perhaps not with all stops being pulled by government agencies to make it appear that we are not in the recession that everyone knows we are in. This report was yet another disaster, and it would have looked much worse if birth death assumptions came from planet earth rather than Bizarro World.